by STORMR. The best hunting is usually brought on by the worst possible weather. Brutal cold, north winds, rain, sleet and snow is what brings new ducks into an area. Waterfowl hunters simply can’t wait on milder weather. outerwear provides maximum comfort and maneuverability, as well as huge thermal benefits in a thin, soft, flexible, windproof and waterproof shell. There’s simply nothing else like it on the market today. The old days of bulky layers on top of layers of clothing made it nearly impossible to shoot. STORMR products have combined comfort and protection from dangerous weather conditions with the ability for a hunter to move freely. 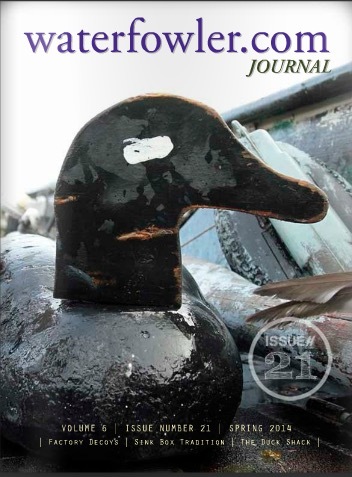 adapts them to the unique demands of the waterfowler’s environment. All of STORMR’s technologically advanced and user-friendly features are integrated in the jacket, including an interior cell-phone pocket, call holders and tether, as well as two large shell pockets. The great STORMR features are also integrated into the STEALTH Bibs. Take advantage of a kill switch D-ring, two fleece line hand warmer rests, call holders and tether, and knee-high splash-proof zippers for easy on and off. 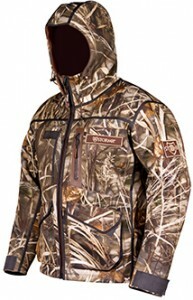 anglers and mariners, and now hunters can enjoy the same features and protection with a camo version. The TYPHOON remains the heartbeat of the STORMR line, providing a baseline of important safety features and unmatched maneuverability. As with the other series, the TYPHOON comes with 3M reflective graphics and nearly five pounds of positive buoyancy. This jacket’s warmth, comfort and safety features give hunters the ability to stay out longer and perform better when the ducks and geese are flying. jackets and bibs. Now hunters can blend into the swamp, field or flooded hardwoods while remaining warm and mobile, even under the nastiest conditions. Gloves offered by STORMR come in two different styles and offer high-stretch premium neoprene, micro fleece lining, durable hi-grip palm, anatomical fit, 3mm total thickness, glued and internal blind stitched seams, and they are waterproof and windproof. The STORMR beanie is a superior thermal insulator. It sheds water, wicks moisture from your scalp and keeps you warm and comfortable no matter what the conditions.